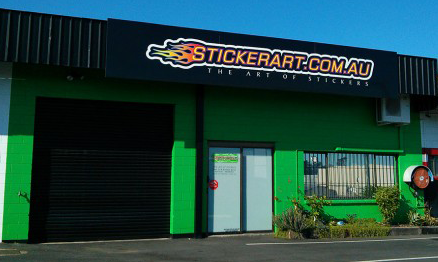 In business since 2003, The Art of Stickers is located in Brisbane, Australia. We offer various types of stickers, signage products, and many other products. We cater to the individual and large company's needs. If you're one person or a company of 1000's, the team here at The Art of Stickers will do their best to help you. We will get your orders delivered to your door. Help you save significant money by installing signs yourself. We believe in quality and use only trusted materials because your brand is as important as ours. We have a large range of pre-designed graphics available for immediate purchase as stickers and decals in various sizes and colours. We offer customised stickers and signage as well as vehicle signage as install yourself, or we can install for you if you are local to us. Currently we specialise in smaller quantity stickers and decals, car magnetics and full colour digital printing on self-adhesive vinyl, however we are constantly evolving and expanding products we offer and if something isn't listed on the website, please don't hesitate to contact us and ask if we can make it. If we can't make it, we will try and recommend someone to you or try and steer you in the right direction for a supplier. Visits to the workshop are welcome however we do prefer you contact us first with your query via email at sales@stickerart.com.au or call 04747 94747. We would like to take this opportunity to thank all past and current customers if they are reading this and to any new customers, we sincerely hope you find your experience at The Art of Stickers a pleasant one.